Another week is almost behind us. We are starting to get those huge Autumn spiders in our yard. They are about one inch in size at their largest and very scary looking as they seat in the middle of their large spider webs. Its that season again. Probably for about 2-3 weeks and then they will disappear for about eleven months. I’ll try to take a photo of one of them if I get a chance. Today’s photo is probably an easy one for the most of you. First, very similar composition was posted here sometime last year, so any old timers will recognize it, or otherwise many will probably just know where it is. The colors speak for itself. 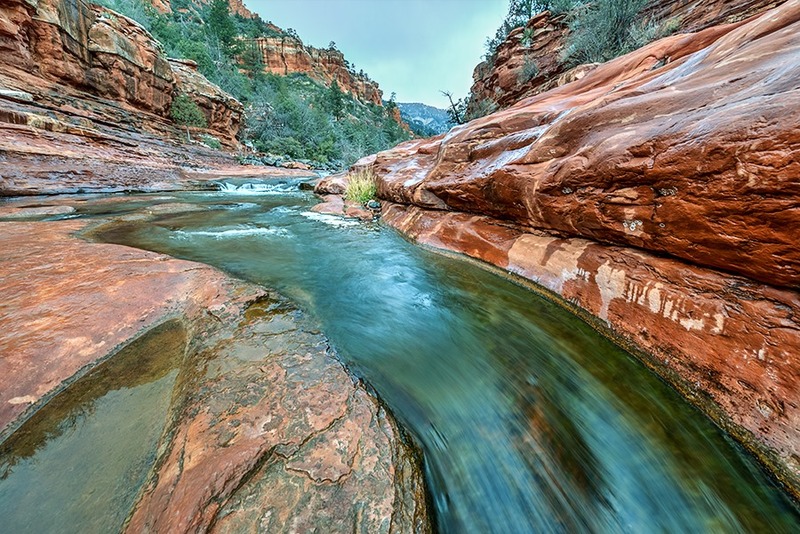 Weekend update: It is at Sliding Rock State park, just north of Sedona. David Bright Photography identified it first! This entry was posted in Arizona, Sliding Rock State Park and tagged Friday Mystery Photo; Arizona; Sliding Rock State Park. Bookmark the permalink. Ouyeah, nice photo with great colors. I really like this long exposure. Nice shot! Wonderful place and photo! Nice weekend! Slide Rock Sedona Arizona! Beautiful place in the high desert. Fantastic! This is another one I could definitely see on Bing. Great job. Superb landscape with fantastic colors. Wonderful picture with wonderful dynamism. The Sedona area. Gorgeous place any time of the year, except during the monsoon season. I would have to agree that this is taken in Sedona…absolutely gorgeous. Beautiful color and capture of movement. Makes me want to road trip there!